If you’re anything like most people, you’re probably feeling the pinch thanks to rising food prices. There is some good news though – you can bring your food shopping costs down with some careful planning. 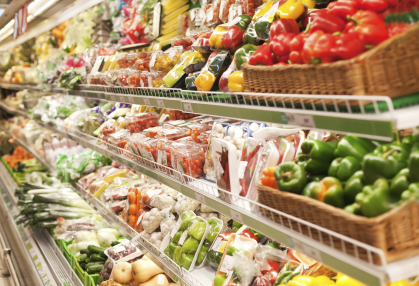 Here are some tips to help you to save money on your supermarket shopping. Stick to your list. If you’re not organized, it’s much more likely that you’ll be tempted into buying things that you don’t really need. Go prepared, and you’ll spend less time in the store. To help you plan your list, it’s useful to plan your meals in advance so that you know exactly what you need and won’t be wasting food. Familiarize yourself with the store layout. Where possible, try to structure your shopping list so that it relates to the order of the aisles. This will enable you to move from aisle to aisle without having to go back and get things that you’ve missed out so there is less chance of being sucked into impulse buys. When you’re scanning the shelves, be aware that the products at eye level will mostly be ones that the supermarket wants you to buy. Check the higher and lower shelves to see if there is a better deal there and you might be surprised. Know where the impulse buys will be. Supermarkets tend to strategically place their offers at the end of aisles in the hope of grabbing your attention while you’re on the move. The other big temptations are the sweets and magazines by the tills, so keep away from these when you’re queuing. Once you’re aware of where the potential slip-ups are going to be in the store, you’ve got a better chance of not falling prey. Be careful with promotions. Offers like “Buy One, Get One Free” or “3 for 2” may look good on paper but before you load up your trolley, give yourself a reality check. Were you going to buy the product anyway? Is it something that you can stock up on and put away for a few weeks? For non-perishables like toothpaste, toilet paper and canned/tinned goods, there’s no harm in taking advantage of these kind of offers. Don’t shop hungry. If you’ve got food on your mind when shopping, you’ll probably find your willpower goes straight out of the window. Shopping on an empty stomach means you’re more likely to find yourself slipping things into your trolley or basket that weren’t on your list. Eat before you start shopping if you want to keep your spending to a minimum! Limit how many trips you make. It stands to reason that the less times you need to visit the supermarket, the less you’ll spend. Switch your weekly shop to a monthly one if you can. We have been shopping monthly for 3 months now and it is working great. Switch to a cheaper brand. If you’re used to buying branded products, challenge yourself to try out the supermarkets own brands. As well as helping you to save money, you may well find that the difference is price-related rather than taste-related or quality related. In many cases, you’re paying for fancy packaging and the assumption that what you’re buying is far superior in quality, when in reality it may not be all that different to cheaper counterparts. Time your shop right. Believe it or not, when you show up at the supermarket can make a big difference to how much you spend. In the evening, supermarkets tend to start knocking down the prices of goods that are nearing their sell-by date and haven’t sold yet. You can sometimes save as much as 75% if you’re around to take advantage of them and don’t mind that they’ll have to be eaten quickly. We have gone on Saturday nights before and done quite well. Despite food prices being on the increase, it’s still possible to cut your food shopping costs. In some cases, this will involve changing your buying and eating habits but you can also save money by shopping prepared. So, have you been feeling the food price increase? What have you done to make supermarket shopping more manageable? I often make the mistake of shopping while hungry, and I pay the price at the register. Also, shopping with small children rushes me and I always pick up more than I need. I have heard others relate those same two issues before. While it isn’t always possible to shop without the kids, you can fix the hunger issue. Even a handful of nuts or an apple can tie you over until you get back home. Glad to hear you are so motivated and controlled. Many people can’t express will power no matter how much they try. Body building hey? Do you do regular competitions? How many supplements do you have to take? Good list. Also, be careful not be enticed by ads offering super low prices on a few select items, and then end up buying other full-priced items. It takes discipline, but just buying the great deals without succumbing to buying other things can be helpful. For example – if you see avocados for sale at $0.25 each (deal! ), but then see a guacamole kit right next to it in the store, at $3.00 each, then whatever deal you get on the avocados will be wiped out by purchasing the other item. I totally agree. It easy to get swayed with these deals and being alert about the cost of what things should be is key. Thanks for the great tip. My wife does meal planning and we look for ways to cut expenses. WE statrted to have at least one vegetarian meal a week. Yay, a veg meal a week. That is great. Being a veggie myself I like hearing these kinds of things. It is amazing how much you can save when you don’t eat meat. I am glad to hear you meal plan. We find it essential and a great budget saver. If I can just chime in here…I, too, love hearing when people do one or two veg meals a week for whatever reason. Just be careful that you’re doing is with beans, pasta, vegetables and none of the soy/meat substitute products. They are expensive and are a chemistry experiment! Thanks for the info Jana. I am a vegetarian and I agree with you somewhat. Yes eating fresh veggies, beans, and whole grains is good for you. However not all meat substitutes are bad for you. The processed package kind are like the ground round etc. but plain tofu and tempeh are very good for you. Basically check the ingredient labels and eat as fresh as you can and you will be fine. I think it’s the number of trips to the grocery that get me – Usually I can keep the purchases down and if I buy extra im canning, but going to the store so often is what gets me. We schedule our shops and we find out that works well. If we run out of something before the next scheduled shop we just make due. Plus this saves us going back and forth a bunch of times. That one more thing can really get you. I have been there. Try making a list and scheduling your shops. That way you won’t have to make extra trips and risk buying things you don’t need. IMHO, everyone should search for a coupon class in their area. There are tons of blogs that highlight YOUR grocery store, with coupon links attached. I have reduced our food/household products expenses for two from 85 a week to 40 a week. I have done this for a year! Thanks to the blogs, you dont have to cut a single coupon (virtual coupon system) until it comes up on a buy list for your store. I never spend more than 20 minutes making the list/compiling Q’s, or more than 20 minutes in the store. 20 minutes of work is doable for me to save 40$ a week. I recently paid 1.99 for a 50 pack of diapers for our granddaughter. We are on a lowfat diet, so no, it is not all a bunch of highly processed foods. Additionally, you end up buying name brand American made products, keeping our economy going. I dont if we make 1ooK or 10k this year, I have made sure we are excellent stewards of our $$. Plus, it is so exciting to see savings, 44$ out of pocket 4$. Yes, that was my receipt last week for Oil of Olay. Some save to put food on the table, some save for exotic vacations. It works for everyone. Glad to hear you have been so successful with couponing. You have done really well. I think it all depends on what you buy if couponing would work for you. Where I live in Canada, there are not a ton of coupons for the things we use. I do like the virtual coupon platform though. Not only does it saves trees but it also makes these deals highly accessible. This is such sage advice. Knowing the store layout can go a long way to dissuade one from making impulse purchases by decreasing the temptation. Supermarkets aren’t designed in a trivial fashion: the very layout encourages one to spend. I know, it’s crazy hey?! The fact the go through so much effort to entice people. It is brilliant marketing really but not good for people’s health or paychecks. We like to shop at the same places so we can memorize the layout and know where things are. This saves time and keeps us from getting distracted. All good effective rules. I have a planned route through the couple stores that we frequent, so we don’t waste time dilly-dallying. The more time spent in the store, the more is purchased. A planned route hey?! Good idea. I am going to have to try that. I like staying to the periphery (not the centre of the store) because that’s where all the nonprocessed (aka cheaper) groceries are. We do the same thing but it’s easy because I love those foods anyways. I am the type that can never get enough produce. It is funny but I do feel strange eating things out of a package. It just doesn’t often seem like real food. What I have found if you don’t really shop in the middle of the store where the processed crap is you can save a lot of cash! Absolutely. People tend to say that healthy food is expensive when in fact it’s not. If people just bought fruit and vegetables they would save a lot of money. All of that boxed stuff really does add up.